Here’s our rendition of the Frozen quilt in Fons & Porter’s Love of Quilting. The kids want to submit it for possible group quilt entry in the East Cobb Quilt Guild Show. We’ll name the quilt and fill out the paperwork at clubs on Friday. I’ll get the thing quilted before club showcase on March 27th. After clubs are officially over, I’ll see if some of them want to come add silver stars (clasp stitch on my Janome 6600) to add some interest around Elsa and Anna. We could do this during their specials or recess time. It would be so cool for them if our entry was accepted. 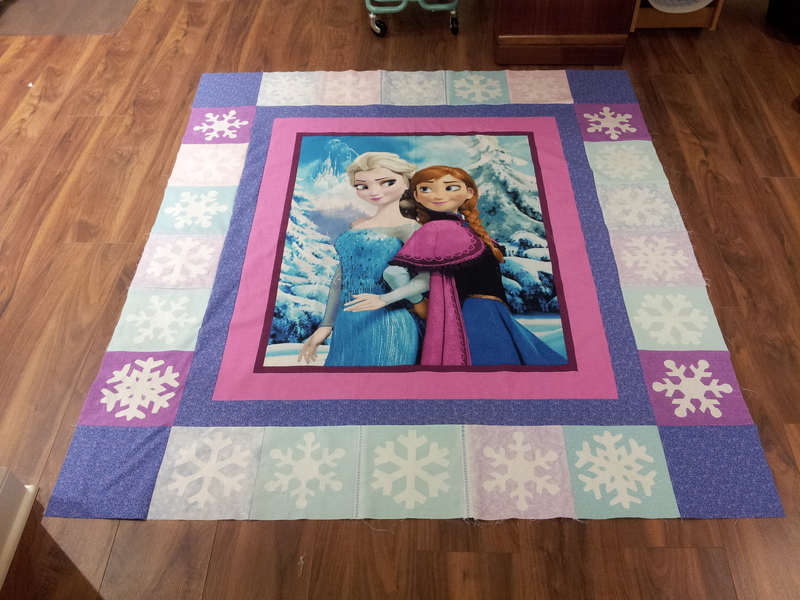 They picked the fabrics, made the snowflake appliques and decided the final arrangement of the snowflakes in the outer border. I merely stitched it together (with a little bit of help). We have to make our label. I also want to make a QR code tied to a recording so the kids can tell the story of how the quilt came to be. When all is said and done, the quilt will hang in the Media Center.